It’s been a year now since we moved into our 200 sqft airstream tiny house. If only I could go back and advise the younger me about the lessons ahead. 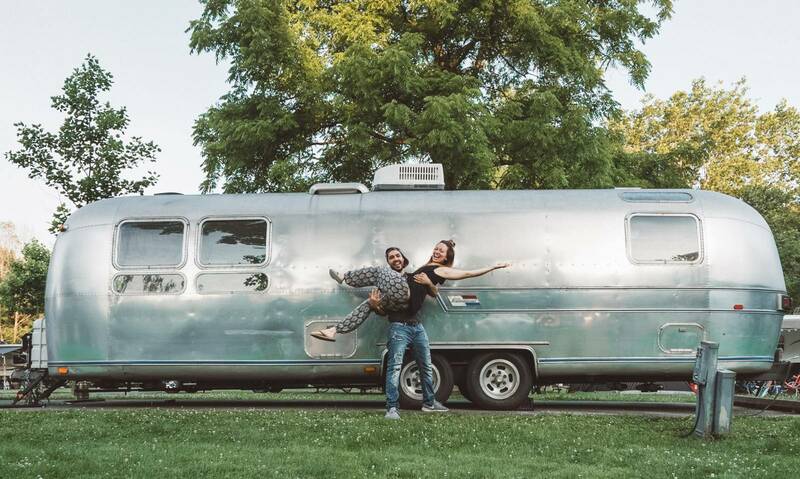 What started out as a night drinking too much cabernet and many hours on Pinterest, resulted in my wife Kristen and I buying keys to a 1976 Airstream off Kijiji. We spent a year in renovations, sold 90% of our belongings and enthusiastically prepped our life for the nomadic road ahead. Was it worth it you ask? Yes. Would I do it again? Ahhhhh…keep reading. Living in a tiny house is astounding, don’t get me wrong. I’m sitting here now in my petite office, parked in the middle of a field surrounded by trees, next to a lake. You can’t beat this the mobility, freedom, empowerment and all around mobility of this lifestyle sometimes. 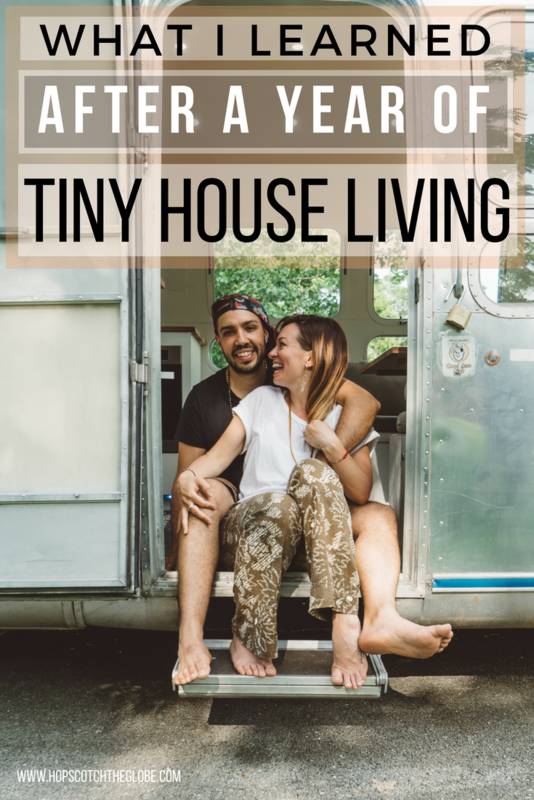 If you’re debating whether tiny home living is for you, then I urge you to at least rent a trailer for a few months and see how you adapt to small living conditions. Say goodbye to your collectables, long showers and having a full wardrobe. On the flip side, say hello to less cleaning, lower expenses and more efficient appliances. We almost exclusively use Furrion for our appliances and built-in electronics. They also released an exterior Vision S camera system which has made driving and parking way easier. 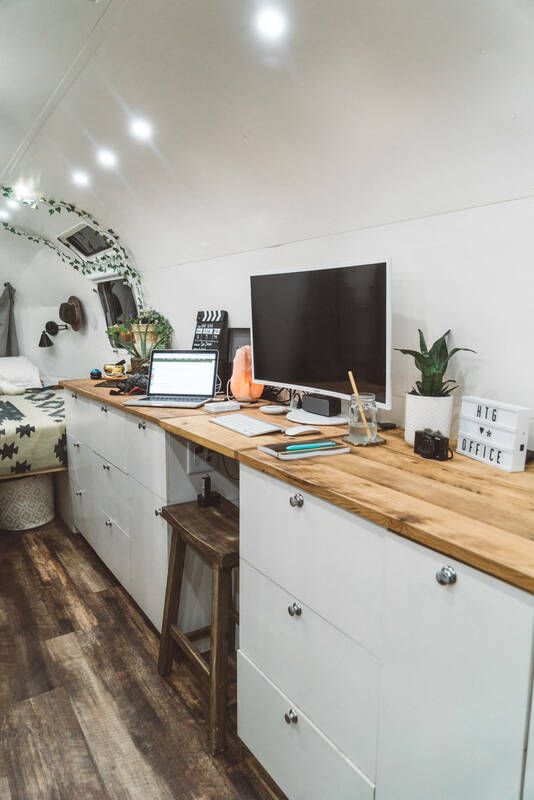 You may notice we talk about this company frequently, it’s because their products have made our airstream tiny house both functional and elegant! We recommend them to anyone upgrading or renovating an RV/Boat/Tiny House. It was exciting and stressful at the beginning, as many things are. Neither of us had lived in a tiny space like this, nor towed anything before. Trailers in the 70’s didn’t have fancy built-in gadgets like reverse/side cameras but thankfully the Furrion cameras were easy to install. We didn’t know how to properly hitch up to a truck, how to deal with the trailer swaying downhill next to a cliff (screaming didn’t help surprisingly), or how to safely change lanes. If can make a recommendation, buy a good hitch system, get new tires and install a camera system. They’re life savers, literally. You'll find a video at the bottom of this post with the camera install + a wild road trip through American National Parks. Our journey to California started in Ontario; curving around the great lakes of Ontario, slicing through the prairies of Manitoba and Saskatchewan and ascending the Rocky Mountains of Alberta and BC. Getting to each checkpoint held new opportunities for tiny house learning (aka challenges). Driving in the rain taught us how to leak proof a wheel-well. Changing lanes with a blind spot and dodgy reverse parking resulted in learning how to install a camera system. Not having a black water tank taught us about compost toilets and the struggle of 1-ply toilet paper. 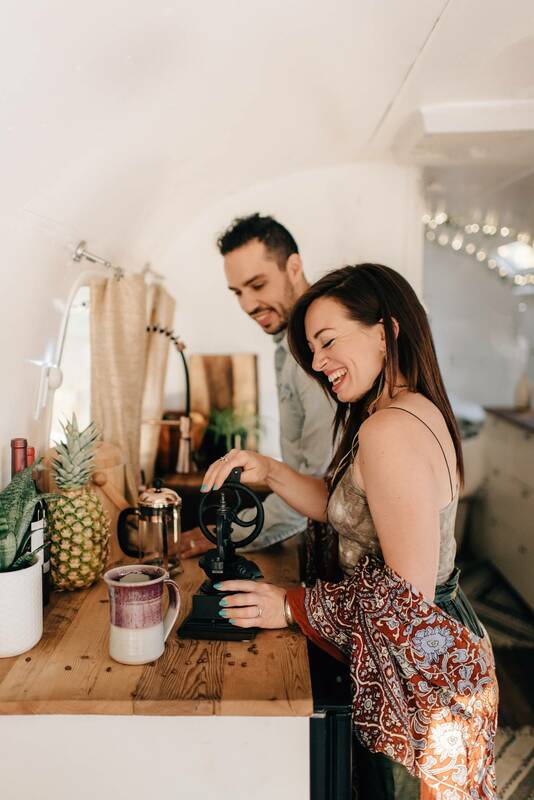 Living off the grid in our new airstream tiny house taught us how to use solar panels, organize our belongings, live on less and the list goes on. If I had the choice, would I choose to in an airstream tiny house again? The answer is yes, but only because I have the knowledge I have today. We don’t just live in a tiny house, it’s a tiny house on wheels. We had to learn about RV living, Tiny Living and Off-Grid living at the same time. I don’t recommend going this route unless you’re ambitious or already have some prior knowledge in these categories. It has taken us a year to get comfortable with the ins and outs of this silver bullet. Everything we have learned is featured on our YouTube channel and in other articles you’ll find here. We've been through the struggle so you don't have to. Before you click away, you're definitely going to want to click on the video below to watch Luna the Airstream in action. I drove her from California to Ontario on an epic road trip with my father and our adorable pup Atlas. Click play and get ready for an awesome road trip, Airstream style! A special thanks to Furrion for sponsoring this post about our tiny house on wheels. As always, all thoughts and opinion are my own. We only promote brands we 100% believe in and use. A really cute house. I like the airstreams. I hope you have the necessary appliance in the RV/airstream. to have a good adventure. Willkommen bei den Rückfahrkamera Profis Hamburg. Ihre Sicherheit ist unsere erste Priorität! Deutschland vertraut den Rückfahrkamera Pro Hamburg, bereits über 276.808 zufriedene Kunden denn wir haben die Erfahrung mit rueckfahrkamera Systemen und bieten Ihnen erfahrenen Service. Wir sind die einzige Firma für Rückfahrkamera Systeme in Deutschland, die Ihnen komplette Systeme für diese einzigartigen Preise anbietet. That’s a cool place to live. I haven’t heard of Furrion before. I might check them out for appliances and electronics. Thanks Dirk. Furrion makes some great products for RV and tiny homes. We’ve been happy with all our Furrion products. Wow! Cool Idea. Love this article for its innovative idea sharing. I am eager now to try this. Thanks for sharing yours thoughts. My boyfriend and I really wants to try doing this, I hope someday we are able to be! You guys are such an inspiration! It’s really an important article. Your all tips are awesome. That looks like such an amazing place to live. I would love try out tiny living. I think it would be a great experience. But if i’m gonna be honest with myself, I don’t think I could last long like you did. I’m such a messy girl and i have so many things so I think my messy stuff won’t fit a small space.I might ask my husband to try it out for a few months like you mentioned because I really want to experience it. Good luck on your travels!